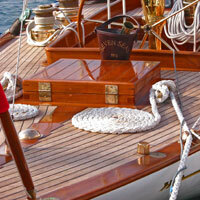 A colourless protective and decorative varnish for all woods used in maritime technology. Combines performance and ease of application. Decorates and waterproofs the wood. Protects it from UV. Provides optimum protection of surfaces subject to intense and difficult climatic conditions. Ideal for rooms subject to a lot of moisture (bathrooms) or for boats. Enriched with flexible alkyd resins to resist the dimensional variations of the wood. Easy to apply. Excellent brushing, flow and application properties. Does not blister or flake. Washable. Colourless. Preserves the natural appearance of the wood. Protects and decorates doors, door and window frames, shutters, frameworks, weatherboarding, furniture, boats (above the waterline). 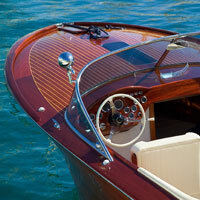 New or previously varnished wood, except wood types containing an anti-oxidant (eg: Iroko...). Apply a coat of dilute Yacht Vernis. Allow to dry. Apply a coat of Bouche-Pores. Sand lightly after hardening. Dust off. End with a coat of Yacht Vernis. Repeat the operation if necessary. 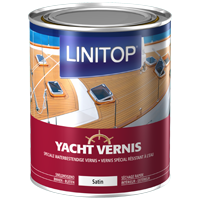 Apply a coloured coat of Linitop Prim & Finish according to the recommendation (Do not sand). After drying and without sanding, end with 2 coats of Yacht Vernis, sanding between these two coats. For an optimum finish, round the corners of the wood by sanding manually. Dust off. For the first coat, dilute with white spirit between 5 and 10 %, same when applying with a spray gun.